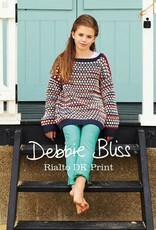 Debbie Bliss Debbie Bliss Rialto DK Prints Pattern Book - Woolly&Co. A collection of projects for children combining Debbie Bliss Rialto DK Solid yarn with Rialto DK Print. Kids will love the fun stripes and comfort of these projects, and you'll love the easy care and enjoyable knitting! Featured patterns include Alice, a sleeveless girl's tunic with a striped, cabled yoke panel; and Bobby, a raglan pullover with striped body and solid sleeves.